A new line of inexpensive and compact fiber-coupled photodiode modules simplify capturing fast transient light signals for analysis. 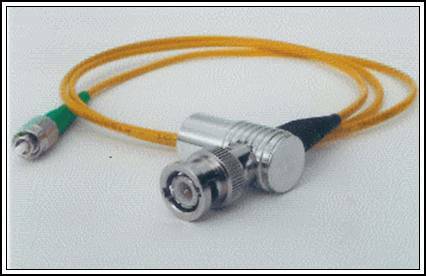 These devices are intended to approximate as closely as possible, a length of fiber optic cable that can be connected directly onto the input jacks of your oscilloscope or other electronic data acquisition device. Conversion of the optical signal to electronic current and voltage occurs at the last possible moment, within a mm or so of the input jacks of your scope. Co-ax cable and the problems of reflections, termination loads, phase distortion and so forth are totally eliminated. The devices are extremely compact and rugged, taking up about as much room as a typical BNC terminator. They come in unamplified versions for use when sufficient light is available, and amplified versions for low light levels. We will build photodetector modules to your specifications. Power: internally contained, easily replaceable DL 1/3N battery. We will build your modules with whatever optical fiber, cable and connectors you specify. We normally stock single-mode 9/125 µm and both 50/125 µm and 62.5/125 µm multimode fiber with 0.9mm polymer buffer and 3mm Kevlar jacket. Other types such as 100/140 µm are available. The fiber to photodiode connection is angle polished for low (-45dB) back reflection. The input end of the optical fiber will be fitted with whatever type of optical fiber connector you desire. The range of normal options include: none, i.e. a bare fiber pigtail, 2 mm ceramic ferrule only, NTT-FC, SC, ST and SMA. The fiber end itself will be polished to any of the standard specifications: flat, PC, SPC or APC (8o). If you need something else, just specify so on the Order Form. If the signal you want to analyze is in the form of a beam in free-space we can provide light collecting optics instead of or in addition to the optical fiber connectors described above. A 6 mm diameter fixed focus aspheric lens assembly is available. We also offer a micro-alignable fixture with 18 mm aperture focusable achromatic lens. Precision fine thread adjustments allow you to maximize the coupling of the incoming beam into the fiber. The unit is also directly compatible with "micro-rail" optical component systems made by Newport, Melles-Griot, ThorLabs and others and is "C" threaded for compatibility with Edmund Scientific's modular component line. Finally, large aperture catadioptric systems for collecting light from weak, distended or distant sources can be provided. Details available upon inquiry. The two major considerations in selecting the photodiode for your application are spectral response and speed. Photodiodes based on different semiconductor materials have, in general, different ranges of light wavelength to which they are most sensitive. For example, Silicon based diodes are most sensitive in the 400nm (nearly UV) to 1000nm (near IR) spectral range and cover the visible well. 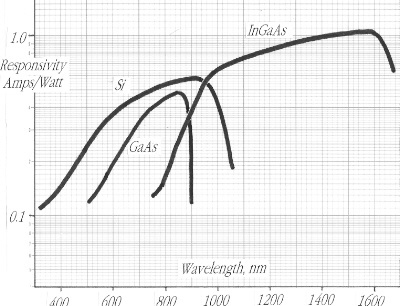 InGaAs is relatively insensitive to visible light but responds well to the IR used in information systems. The intrinsic speed of the photodiode is also determined by the semiconductor material. The higher electron mobility in InGaAs allows response times which are simply not attainable with Si. Our latest GaAs model offers unprecedented speed in the visible range. Other factors which might be important to your needs, such as Dark Current and Capacitance are also listed in the table on Photodiode Specifications. The photodiode in all our modules is reverse biased to minimize intrinsic capacitance for maximally fast response. Specifications are listed for the usual photodiodes. Others are available, call or write for details. where dV is the change in output signal corresponding to a change of dI in the light power input and R is the load resistance. The modules have an internal load resistance of 1,000 ohms. The effective load resistance, R, is thus the parallel combination of this internal 1,000 ohms and any external termination resistance such as the usual 50 ohms of an oscilloscope input. Since the Responsivity is near unity, in general, you will need on the order of 1 mW in the optical input fiber in order to get output signals in the 50mV range with the Series G modules with 50 ohm termination. You can get higher sensitivity if your scope has a high impedance input option. In this case the 1,000 ohm internal load resistance will dominate and the signal levels will be twenty times higher. Note that the bandwidth will also be reduced by this same factor of twenty. If you need full performance at low light levels see the Series F section. Electronic output connector choices include BNC, TNC, SMA and SMC in either gender. Wiltron-K, 7/16 and others are available at some extra cost. Please note that BNC connectors are not recommended above 2 to 4 GHz. If you need something really unusual, specify on your Request for Quotation or call to discuss your needs. The output connector is directly coupled to the biased photodiode so that these Series G modules are DC coupled. The unamplified Series G modules have very low current drain and the small internal batteries should last for a year or so of normal use.